I’ll never listen to Journey the same way again. Call this film a cautionary tale. Perhaps the message was: never move to L.A. You’ll end up a stripper, or a member of a boy band, or a filthy politician, or in love with a rock god, or worse…you’ll become the rock god and never find real love. Cautions all. Here’s another one: Caution: don’t see this movie. Never before have I yelled mid-film, “This is the worst movie I have ever seen!” And I’ve seen some bad’uns. First, it’s a musical. Hairspray and Mama Mia meet Spinal Tap minus Christopher Guest. Someone should have let this all star cast in on the inside joke before they took it too seriously. Some, like C.Z.Jones played it camp, like a native of the theater would. She was awful. I’m so embarrassed for her. Her redemption? Possibly only the presence of Bryan Cranston as her fidgety spouse. Do not be fooled into seeing this for Alec Baldwin. He comes out in this film in more ways than one, and he proves to the world, much like Pierce Brosnan did in Mama Mia, that he should never sing. And Russell Brand shouldn’t act. Facts. Finally, expect less from Tom Cruise. He put on quite a performance. Certainly, I couldn’t be anything but impressed by his singing voice and on-stage performances. 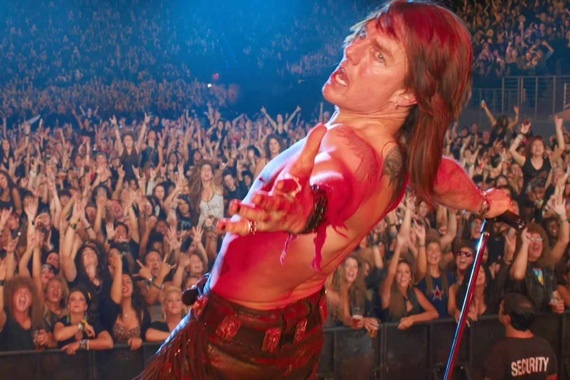 A clip of Cruise as Stacee Jaxx will no doubt add to the clips from his lifetime body of work when they show it at the Oscars in 30 years. His insanity will never be questioned again. This film slipped him right back onto Oprah’s couch. Like a method actor, he played the Rocker with intense realism. He was gag-ably sexual and far too naked. Nasty. I should have walked out. I finally joined the people next to me in fist pumping and cell phone waving. We must have laughed for an hour after it was over. Sadly we were laughing at, and not with. Great article, I won’t be seeing this movie now.. I thought I might try this movie out but now I don’t think so.. Anyone else seen it? Opinions? Great review, Stephanie! You put into words what all of us were thinking. …and no, I’ve never laughed so hard AT a movie. But hey…we had a blast! Thanks! At least it was memorable. I LOVED laughing with you all!